Exactly three years ago, I did one of the most daring things I had ever done in my life – I went on a date with someone I met online. I arrived almost an hour earlier than the designated time because the anxiety and excitement of the first date shoved me out my house way too early. I was meeting a very handsome guy I met on OkCupid.com at a popular coffee shop in Palo Alto called Coupa. He had just graduated and was in the process of applying to medical schools. I was trying to enjoy my summer while recovering from oral surgery. We had been sending each other messages through the website and text messages for a week before I decided it was safe – I mean time – to meet him. Because I arrived at Coupa first, I picked a cozy table in the back and entertained myself with the internet to pass the time, which was moving at a glacial pace. My fingers were dancing on top of my keyboard when a man gently tapped on my table. I looked up, and there stood the guy who up until that moment, to me, only existed in my inbox. Our date was perfect. So perfect that I thought it was all too good to be true. I kept waiting for him to tell me something that might snap me out of Cupid’s spell like “I enjoy collecting human hair” or “I like to set things on fire”. But nope, our date stayed perfect until he walked me to my car and I drove away. Since that first date, we have been inseparable and today we are celebrating our three year anniversary!! As you may know crystal and glass are the traditional three year wedding anniversary gifts. 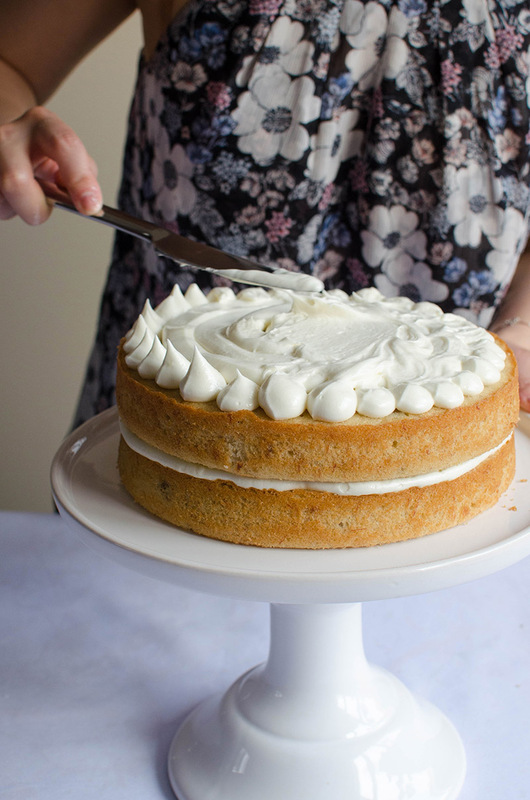 It’s not documented anywhere, but I am pretty sure the three year dating anniversary gift is moist dense banana cake with fluffy cream cheese frosting. Once in a while I try to think of what my life would be like if I had never met Karl. I find it not just challenging but impossible. He may or may not know this (he certainly will now after reading this post), but he changed my life. I wouldn’t be nearly as happy, as confident, as peaceful if it weren’t for him. When I met Karl, I was a young glum Economics student struggling to find passion and purpose in my work and in my life. He had this hardy confidence in me and convinced me I could do anything I wanted as long as I loved it. I changed my major to Psychology at the beginning of my junior year and fell in love with the field. I spent my time doing things I really enjoyed, like cooking and baking. Ironically it was his stable love for me that helped me make my decision to accept a job offer in Boston. Although we were on opposite sides of the country, I could always feel his support and confidence in me. 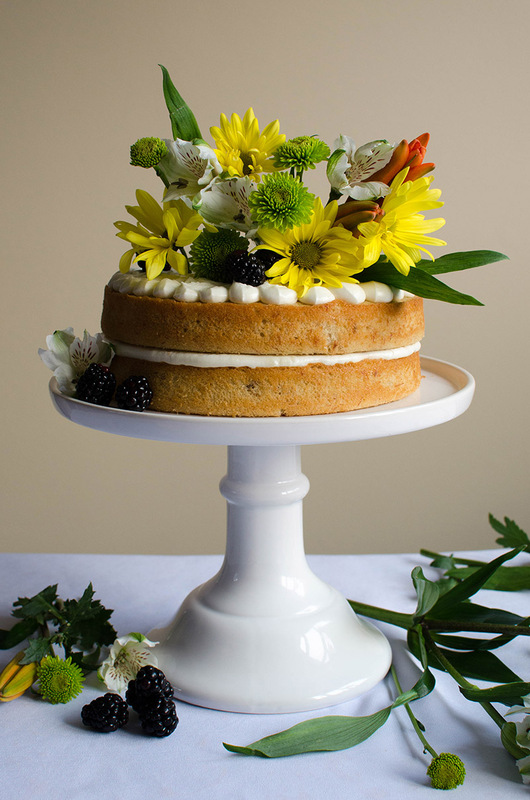 Thank you 100 Layer Cake for the decoration inspiration! The cake recipe was adapted from my burnt sugar cake and fresh strawberry rhubarb cake recipes. 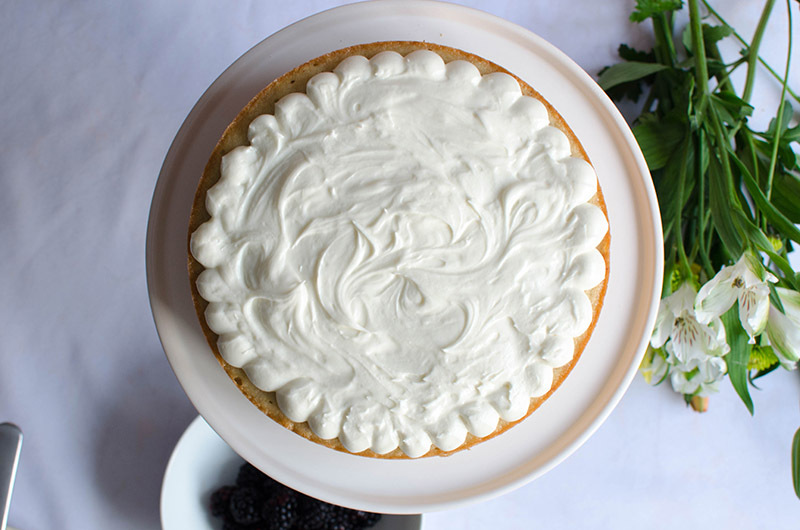 The cream cheese frosting was adapted from my carrot cake with fluffy cream cheese frosting recipe. Preheat the oven to 350 F degrees. Grease two 8'' round baking pans with butter, then set aside. Soak two bake-even strips, and wrap them around your cake pans for flat, evenly baked cakes (optional, but will save you from having to level your cake post-baking). 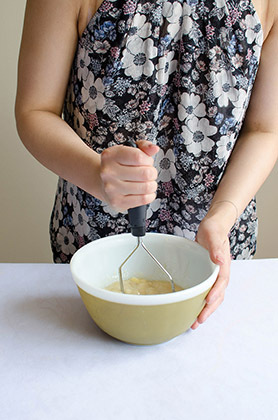 With an electric mixer, mix the butter and sugar on medium speed until completely smooth, about 3-4 minutes. Reduce the speed to low, then add the eggs, one at a time. Add the buttermilk, vanilla extract, and mashed bananas then mix on medium speed until incorporated. In medium mixing bowl, whisk the baking soda, salt, cornstarch, and flour together. Slowly add the flour mixture to the wet mixture on medium-low speed. Mix until incorporated (careful not over mix). Evenly distribute the batter into the prepared pans. 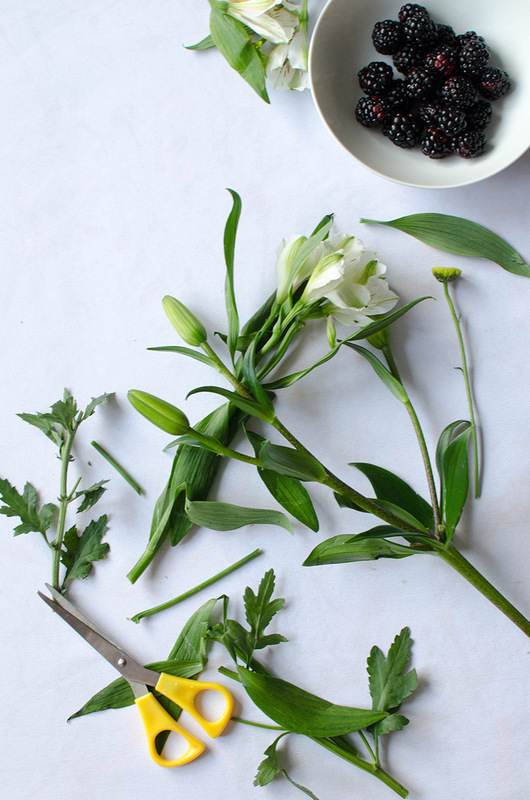 Bake for 35 to 40 minutes, or until a toothpick or knife inserted in the center comes out clean. Allow the cakes to rest in their pans on a wired rack for 30 minutes. Take them out of the pans and allow them to cool completely on a wire rack before frosting. 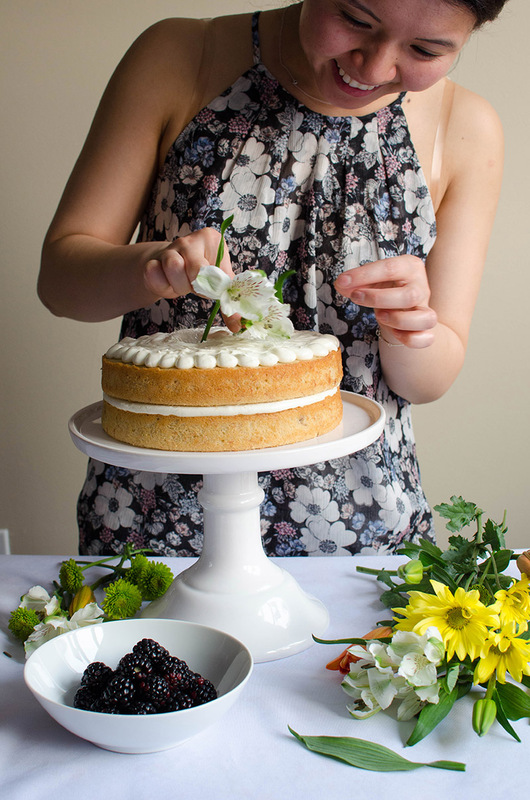 With an electric mixer, mix together the butter and the cream cheese on medium-high speed for 1-2 minutes, then medium speed for about 3-4 minutes. Add the vanilla extract, then mix on medium speed until incorporated. Stop once or twice to scrape down the sides of the bowl. Slowly add the powdered sugar and continue to mix on medium speed, until the frosting is fluffy and smooth. 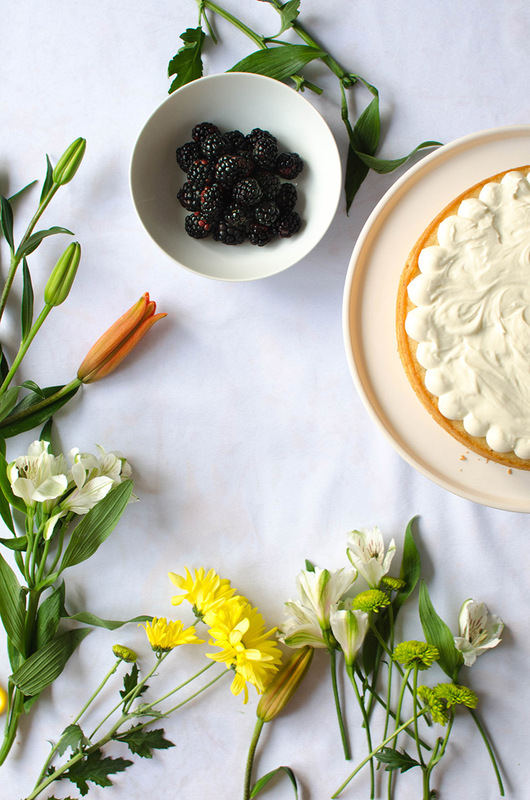 Fill a piping bag or gallon-size Ziploc bag with the frosting. Pipe a thick ring (about ¾ inch thick) of frosting around the circumference of one of the cooled cakes. Fill in the middle with frosting. 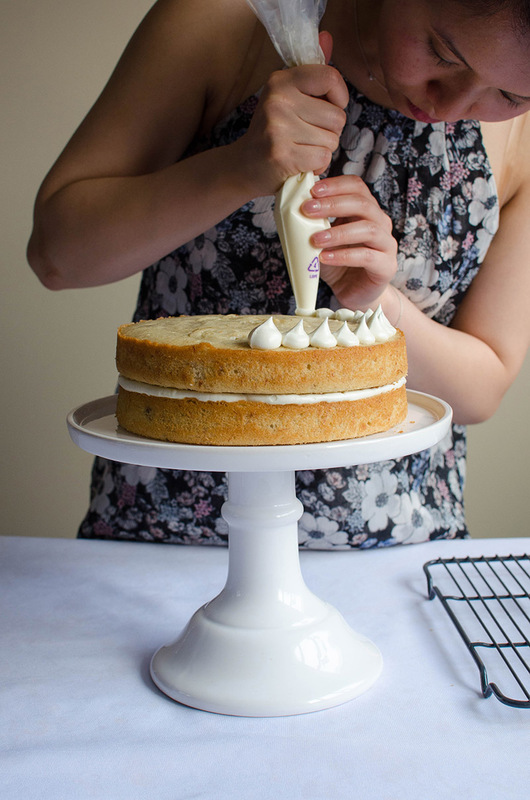 With an offset spatula or knife, smooth out the frosting so that there's an even layer. Place the second cake layer on top of the first layer. Pipe a circle of pearls on top of the cake to create a scalloped edge, then fill in the middle with frosting. Using a knife or an offset spatula, smooth out the pearls towards the middle. 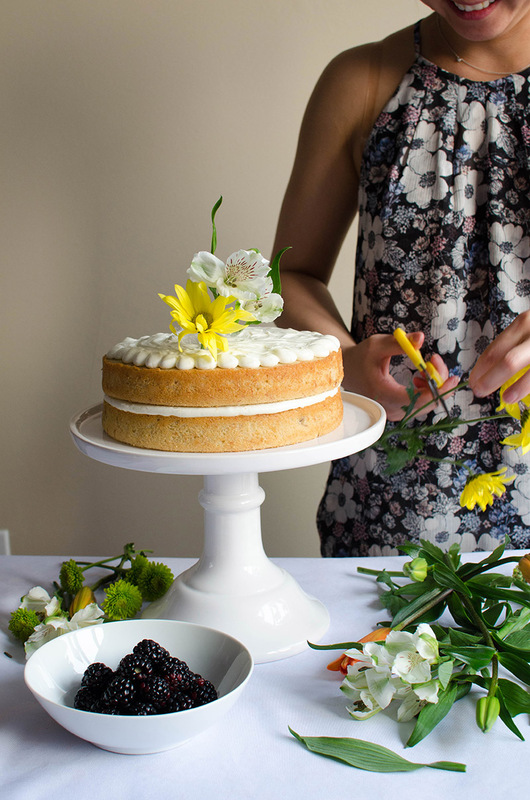 If you're topping your cake with fresh flowers, wrap the stems with plastic wrap then insert the stems directly into the cake. 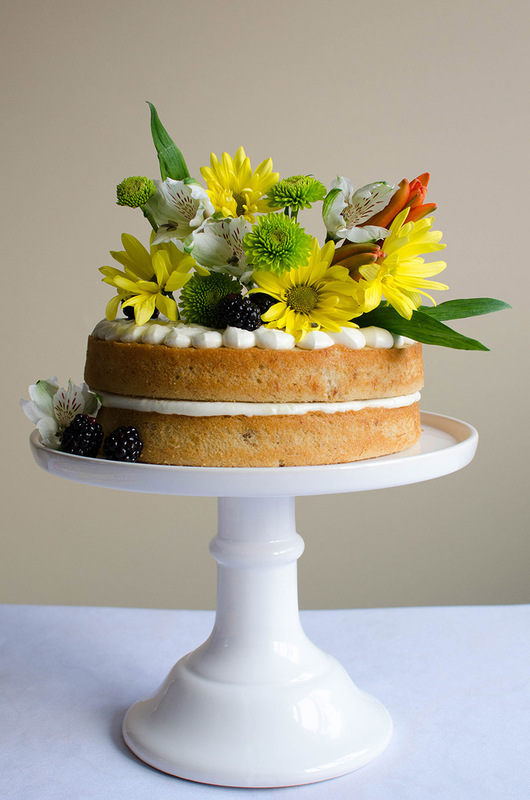 Place the blackberries around the cake. 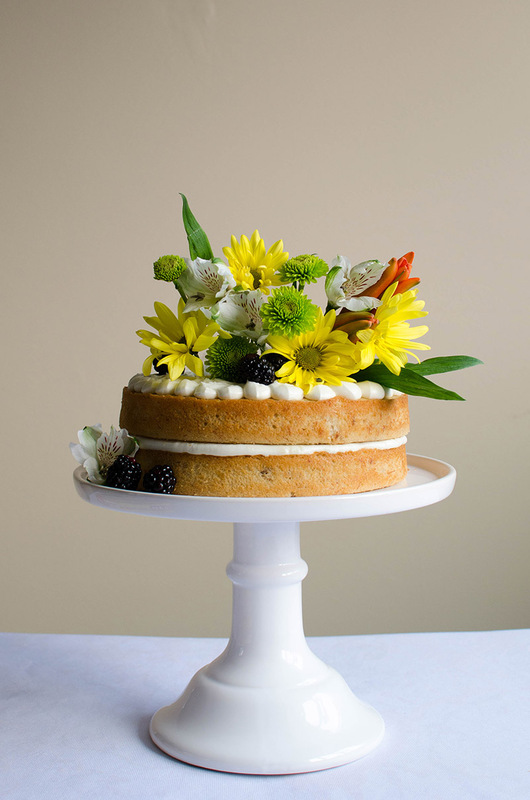 This entry was posted in Desserts & Sweets and tagged banana, buttermilk, cake, cream cheese, flowers, naked cake. Looks so pretty n yummy! Karl and your roommates are so lucky!! I want a slice!!! I loved reading this post.. congrats on your anniversary! And what a special cake to celebrate with too – this looks amazing. Congratulations on 3 years!! that’s an amazing story! I married my best friend of 10 years, whom I first met on the internet! so we share something common 😉 Love the cake, it’s super pretty! Awww I love this story! What a beautiful cake to celebrate such an important milestone. It’s so inspiring to hear that Karl encourages you to pursue the things you really enjoy in life – sounds like you two are perfect for each other! What a great story, congrats on three years!